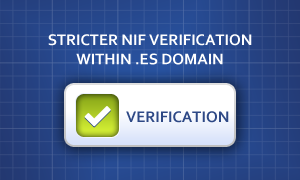 The Registry for .ES domain has announced that the tightened verification process of Spanish contacts for organisations / legal persons becomes effective as of April 21, 9:00 UTC. The contacts will be rejected if the NIF ( Número de Identificación Fiscal) is missing or incorrect. It will be possible to modify contacts as in the past months. A CSV file from Key-Systems will be sent to you and you will be able to correct the NIF for the given domains via the web interface. The .ES Registry will contact the registrants who have not changed their data as of then to notify them of their obligation to correct the information. The Registry will also inform of a cancellation procedure of the domain names with incorrect data to commence in November. This cancellation procedure will apply to domain names registered by a Spanish legal entity. The .ES Registry will begin a cancellation process for domain names with invalid owner contact data held by Spanish legal entities. To ensure compliance with the regulations, commonly requested information related to individuals or bodies with or without legal personality include a full name, a valid e-mail address, Tax ID Number, National Identity Document or other equivalent official identification document. The Registry has the right to cancel domain names that fail to comply with the required terms and conditions. Should you have any questions regarding the above announcement or need assistance, please contact our Support Team at support@web-solutions.eu.